All-day breakfast is the newest trend in the restaurant business — even McDonald’s has introduced an all-day breakfast menu — but, here in Hawaii, we’ve been doing all-day breakfast for years. There are a few places in the islands that have perfected the art of anytime pancakes, waffles, and eggs, and we’re here to help you navigate which are the best. 1. Eggs ‘n Things-Oahu: You KNOW the food is good when there’s a line out the door at 7 a.m.! Eggs ‘n Things first opened in 1974 on Ena Road in Waikiki, and now the restaurant has three locations, including an Eggspress location for casual dining, takeouts, and people on the go. The restaurant prides itself on using fresh ingredients, keeping the prices reasonable, and treating everyone like Ohana (family). 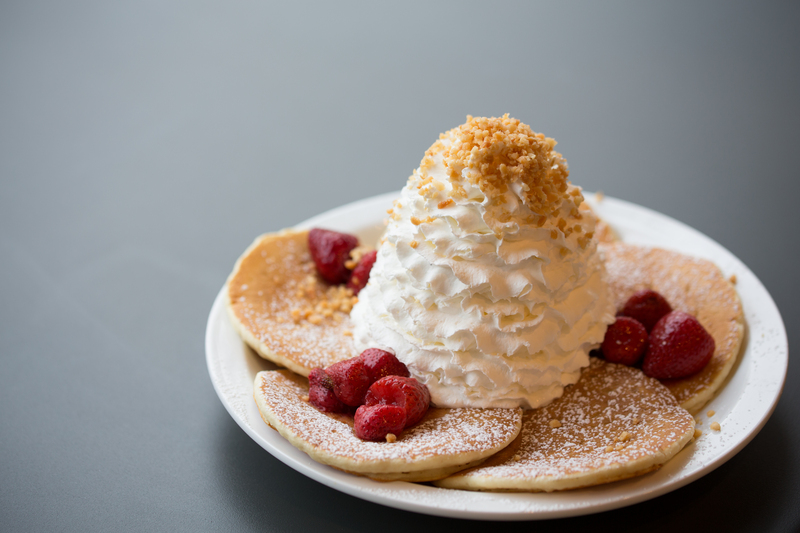 Breakfast and other local favorites are served into the evening, so you’ll never risk missing-out on the eatery’s famous pancakes, omelettes, and crepes. Saratoga Flagship Store is open from 6am-2pm and 4pm-10pm. Waikiki Beach Eggspress is open from 6am-2pm and 4pm-10pm. Eggs ‘n Things Ala Moana is open from 6am-10pm Sunday to Thursday and 6am-12am on Friday and Saturday. At Eggs 'n Things on Oahu, one of the house specialties is pancakes. 2.Moena Cafe-Oahu: Nestled in the heart of Koko Marina Shopping Center in Hawaii Kai, you’ll find Moena Cafe. It’s a small, quaint, bustling restaurant that is, frankly, delicious! Although I’m a “lunch person,” who ate a chicken salad sandwich on the day I went there, I noticed the restaurant served all-day breakfast, and it seemed to be a hit (my lunch-mate that day raved about it!). Owners Eric and Nicole say their desire is to serve the locals and tourists alike and give them a taste of the local Hawaii foods that make our islands so unique. Signature dishes include omelettes, eggs benedict, and the Mo’Egga, elicious artichoke spread over two pieces of bread and topped with poached eggs. Open daily 6:30 a.m-3 p.m.
3. Kihei Caffe-Maui: The all-day breakfast cafe was voted best breakfast six years in a row (2005-2011), and it was voted “Excellent” by Zagat in 2011. 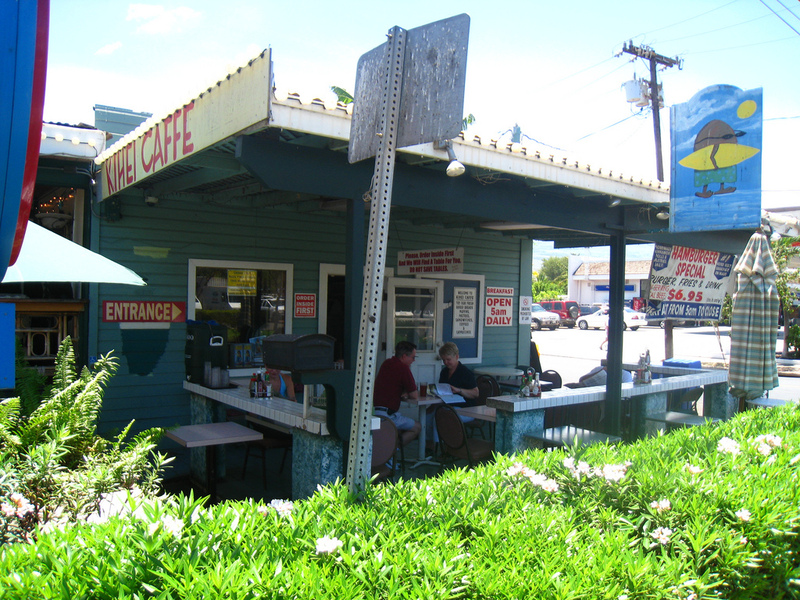 But, it’s not the accolades that make Kihei Caffe great — it’s the local flare. The restaurant boasts more than 40 breakfast choices, including eggs, omelettes, fried rice, fresh baked goods, pancakes, and french toast. After a long morning burning calories while scuba diving, hiking, or snorkeling, make sure you re-energize with breakfast. It’s open daily from 5 a.m. -2 p.m.
Kihei Caffe on Maui was voted best breakfast six years in a row (2005-2011), and it was voted "Excellent" by Zagat in 2011. 5. Kuhio Grille-Big Island: The Kuhio Grille in Hilo is a strong supporter of local products, and it shows in its menu. In addition to lunch items, including the famous One-Pound Lau Lau, you’ll find a ton of great breakfast options, all available all-day. Choose from taro corned beef hash, omelettes, and egg dishes. Open every day from 6 a.m.-10 p.m. Even for a breakfast-avoider like me, these eateries are hard to resist. So, next time you’re in Hawaii and craving a big breakfast, don’t worry about the clock and head-out to one of these amazing restaurants!